physical side effects associated with taking glutathione supplements or precursor supplements. “Glutathione side effects” can be used as a term that describes the positive effect of optimal glutathione levels on our health. For more information on glutathione and its many functions in the body visit our page Glutathione (GSH). Below is the overview of glutathione side effects and precautions associated with the most popular ways of raising blood glutathione and optimizing intracellular glutathione production. All forms of oral glutathione (pills, capsules, liquid, powder, liposomal or sublingual) are generally well tolerated in the recommended doses of 500-1,000 mg/day for up to 6 months (the longest trial so far). In another study with liposomal and transdermal glutathione out of 33 participating autistic children, minimal side effects were noted in 17 children (51.5%); mild side effects - in 10 children (30.3%); intolerable side effects – in 5 children (15.1%). Intolerable glutathione side effects were mostly due to transdermal GSH: rash and increased irritability. The nature of other, milder glutathione side effects was not clarified (Kern JK et al.). The safety of long-term use of oral glutathione has not been established, neither has the long-term use of higher doses of glutathione (more than 1,000 mg/day). As of 2015 oral glutathione has not had enough human trials of large enough scale and long enough duration to better assess its safety. While oral glutathione is considered a generally safe supplement, there are additional precautions to keep in mind. 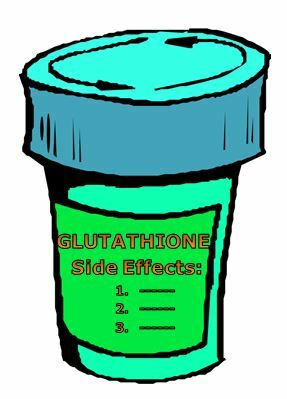 These potential glutathione side effects would affect a small percentage of population (except #1), but are still worth being aware of. 1. There is a concern that flooding bloodstream with glutathione for prolonged periods of time may reduce or even cease the natural intracellular production, because this process is regulated by glutathione itself through feedback inhibition of enzyme gamma-glutamylcysteine ligase (GCL) that catalyzes the first reaction in the synthesis of glutathione. 2. When extracellular glutathione is broken down into its constituent amino acids by enzyme gamma-glutamyltransferase (GGT), glutamate (an excitotoxin) is released and may produce unwanted neurological side effects in those who suffer from headaches and migraines, in people with neurological diseases such as ALS, and in people generally sensitive to MSG (glutamate can convert to monosodium glutamate in the body). GGT is upregulated and breaks down even more extracellular glutathione in the presence of liver diseases or liver damage caused by acetaminophen, heavy metals, alcohol, etc. 3. Oral glutathione is a sulfur contributing dietary supplement most of which breaks down in the gut to its component amino acids and adds to the amounts of sulfur from other dietary sources. In the presence of a dysbiosis of the gut (the state when harmful bacteria dominate the gut), certain bacteria, such as Streptococcus, Enterococcus and Prevotella, turn sulfur into hydrogen sulfide gas at a much higher rate. While hydrogen sulfide is required in small quantities for cell signaling, the higher concentrations of it are toxic to the nervous system and the cells’ little engines, the mitochondria, and also have been implicated in ulcerative colitis. The side effects of sulfur reducing in dysbiosis and excess hydrogen sulfide are foul smelling (like rotten eggs) flatulence and/or burps, intolerance to dietary sulfur, low energy, and neurological issues. If you already have these symptoms due to dysbiosis, oral glutathione may aggravate them. Most of liposomal glutathione supposedly avoids the breakdown in the digestive tract and may not contribute to bacterial sulfur reduction in the gut as much as other forms of oral glutathione. However, it may still contribute to higher levels of hydrogen sulfide in the bloodstream in the presence of these bacteria. 4. Dr. Alan Pressman, the author of "Glutathione. The Ultimate Antioxidant", warns against the use of oral glutathione supplements by patients with ulcers that are caused by H. pylori bacteria. The reason for this concern is that some researchers believe these bacteria survive by feeding on macrophages and neutrophils abundant at the site of inflammation caused by the ulcer. Since glutathione can improve the numbers and activity of macrophages the problem can be exasperated by oral glutathione. 5. Oral glutathione (and topical glutathione creams) are known to inhibit the synthesis of melanin (the pigment responsible for our skin and hair color), making the skin lighter. While this is a desirable glutathione side effect in the treatment of pigmentation disorders and various skin conditions, it carries a risk of increased sun sensitivity, because melanin serves as a protection against the UV radiation (that’s why people with darker complexion can be out in the sun without developing a sun burn for longer periods of time). People with the history of skin cancer should consult a treating physician before supplementing with oral glutathione. 6. 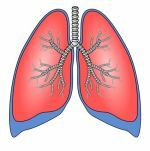 People with asthma should be careful when taking oral glutathione, especially in large doses, and consult their treating physician before using this supplement. Leukotriene C4 (LTC4) is a protein produced by conjugation of glutathione with leukotriene A4 with the help of enzyme LTC4 synthase. LTC4 is produced intracellularly by macrophages, neutrophils, mast cells and plays many roles as an inflammation mediator, in cell signaling, in immunological functions and in maintaining biological homeostasis. Outside the cells LTC4 can convert into other cysteinyl leukotrienes, such as LTD4 or LTF4 which all retain similar biological activity. Leukotrienes production is usually accompanied by the production of histamine and prostaglandins, which also act as inflammatory mediators, and may aggravate existing allergies or bring on the new ones. LTC4 exhibits strong smooth muscle contracting activity, induces bronchoconstriction and enhances vascular permeability and secretion of mucus in airways contributing to the pathogenesis of asthma and acute allergic hypersensitivity. Overproduction of leukotrienes is the cause of inflammation in asthma and allergic rhinitis, and their excess may lead to anaphylactic shock. 7. Nitric oxide can react with glutathione to produce s-nitrosoglutathione (GSNO), a molecule that has many functions in the body, one of them being a vasodilator. Vasodilation is the dilation of blood vessels that leads to lower blood pressure (vasodilators are used to treat hypertension or high blood pressure). This side effect may not be safe for people with hypotension (abnormally low blood pressure). Flushing is one of the physiological responses to vasodilation, observed as one of glutathione side effects in the Allen J study mentioned above (not directly linked to GSNO in this study). Although the amounts of GSNO naturally produced in the body are probably low compared to GSNO administered therapeutically, the production may increase with excess nitric oxide and excess circulating glutathione. 8. Liposomes that encapsulate glutathione molecules in liposomal formulations are often made from soy lecithin. People allergic to soy and those who avoid GMO ingredients should do more research as to the sources of liposomes. 9. Allergy to other ingredients – oral glutathione usually contains extra ingredients and preservatives that may cause allergies. Make sure you read the labels. 10. Oral glutathione in any form may not be safe during pregnancy and breastfeeding, and may not be suitable for children. You should always consult your doctor before starting supplementation. IV glutathione is the way of delivering glutathione directly into bloodstream bypassing the digestive system. In the studies with IV glutathione the doses were 1,200 mg daily for 30 days (Sechi G et al.) and 1,400 mg three times a week for 4 weeks (Hauser RA et al). Some studies with IV glutathione used 2,000 mg doses. The IV method is reserved to treat toxicities, including side effects of chemotherapy and radiation therapy, and it is used in the treatment of such diseases as HIV/AIDS, Parkinson’s, type 2 diabetes, hepatitis and immunological deficiencies, heavy metal toxicities. IV glutathione is usually well tolerated for the prescribed duration of treatment. When glutathione IV is prescribed it is a decision made by a medical doctor who analyzes a patient’s health condition. The benefits of IV glutathione for people with above mentioned health conditions outweigh the risk of possible glutathione side effects. However, in the recent years, IV glutathione and glutathione injections have grown in popularity among people in good health for non-medical reasons as a means of achieving a cosmetic effect of lighter complexion, or as a general immune booster much like oral glutathione pills. Precautions as to the long-term (months and years), regular use of IV glutathione and injections are the same as with oral glutathione above. 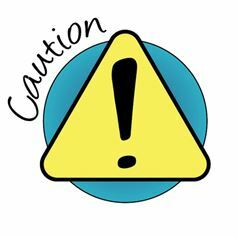 In addition, injections and IV solutions purchased online from unknown sources may be a health hazard and cause serious atypical glutathione side effects. Out of three amino acids that glutathione is made of cysteine is the most important, rate-limiting amino acid. The amounts of available cysteine determine how fast and how much glutathione can be manufactured inside the cell to meet the cell’s needs (each cell regulates its own glutathione production). L-cysteine – supplemental free cysteine is not an effective method of improving glutathione production as it has only minimal effect on glutathione levels. L-cysteine is potentially toxic and may lead to hypercysteinemia. Free cysteine oxidizes very easily in the digestive tract and in bloodstream, creating potentially toxic byproducts and hydroxyl radicals. It may not be safe during pregnancy and breastfeeding, and it’s not suitable for children. People with stomach ulcers should exercise extreme caution because free l-cysteine thins mucus and may further deteriorate stomach lining, according to Dr. Alan Pressman, the author of “Glutathione. The Ultimate Antioxidant”. rare side effects - severe contact dermatitis and hives. There are several drug interactions with NAC. According to Dr. Jimmy Gutman (author of “Glutathione. Your body’s most powerful protector”), death has been reported in association with high doses of NAC. In his book “Health and Nutrition Secrets” Dr. Russell Blaylock warns that there is some evidence that NAC may worsen the neurological effects of mercury by increasing its brain levels, doing so by binding to mercury in the bloodstream and redistributing it into the nervous system. He advises a NAC limit of 500 mg a day for an adult and an increase in dietary branched-chained amino acids that compete with NAC-chelated mercury for the same carrier sites in the brain and thus may prevent mercury absorption in the brain tissues. According to WebMD, NAC may not be safe for people with asthma, or with severe liver or kidney diseases. S-adenosylmethionine (SAMe) – an endogenous (made in the body) molecule that is produced in every cell during the methylation cycle (methionine cycle). SAMe is methionine partially converted to cysteine. In the presence of sufficient quantities of vitamin B6 it can transform to cysteine (transsulfuration cycle) that can be used for the production of glutathione. In fact, methylation cycle is a significant source of intracellular cysteine in our bodies. However, SAMe also coverts easily to homocysteine responsible for the hardening of arteries and heart disease. If there are deficiencies in folate and vitamin B12 (needed to convert homocysteine back to methionine), this may lead to hyperhomocysteinemia. In Europe SAMe is a prescribed medication to treat depressive disorders, osteoarthritis and liver disease. SAMe is contraindicated for people with bipolar disorder because it is known to increase anxiety and cause mania. WebMD also warns that SAMe may not be safe for people with diabetes and Parkinson’s disease. It may interact with painkillers, cough medicines, antidepressants, herbs (St. John’s wort), medications that treat diabetes and Parkinson’s. Since SAMe can affect blood vessels, it should be discontinued at least 2 weeks before any surgery. While no adverse effect were registered in pregnant women, it may not be safe for children and breastfeeding babies. Undenatured whey protein – undenatured whey proteins are an excellent source of bioavailable cysteine (or cystine, which is 2 cysteine molecules joined by disulfide bonds that can enter cells), however, they do vary greatly in purity, quality and biological activity. People with specific whey protein hypersensitivity should not take undenatured whey protein supplements (these are allergies to any or all of the bioactive proteins in whey - alpha-lactalbumin, beta-lactoglobulin, serum albumin, lactoferrin and immunoglobulins). Allergy to casein and lactose, the most common milk allergies, may be an issue if not all casein and lactose are removed during preparation. These two allergens may cause gastrointestinal side effects in people with sensitivities. Since undenatured whey proteins are 70-90% pure protein, people on protein restricted diets should calculate it into their daily protein allowance. People with organ transplants or anyone on immunosuppressing medications should discuss supplementation with their doctor, as undenatured whey has been shown to improve immune function. Individuals with the autosomal‐recessive metabolic disorder cystinuria (excessive loss of cysteine in urine) are at higher risk of developing cysteine nephrolithiasis (kidney stones linked to this condition). A rare side effect may include rash in some individuals undergoing severe detoxification. Rash should abate when the amount is reduced or supplementation is stopped. Undenatured whey protein concentrates or isolates are considered to be generally safe for children as young as babies weighing 10 lbs., pregnant women and breastfeeding women. As always, consult your physician about the possibility of these glutathione side effects before starting supplementation or changing your diet. 1. Effects of oral glutathione supplementation on systemic oxidative stress biomarkers in human volunteers. Allen J, Bradley RD. Journal of Alternative and Complementary Medicine, September 2011; 17(9):827-33. 2. Improvement in clinical markers in CF patients using a reduced glutathione regimen: an uncontrolled, observational study. Visca A, Bishop CT et al. Journal of Cystic Fibrosis, September 2008; 7(5):433-6. 3. A clinical trial of glutathione supplementation in autism spectrum disorders. Kern JK, Geier DA, Adams JB et al. Medical Science Monitor, December 2011; 17(12):CR677-82. 4. "Another piece of the dysbiosis puzzle - sulfur, and sulphate reducing bacteria" by Dr. Tim Gerstmar of Aspire Natural Health. 5. "Gut Flora, Nutrition, Immunity and Health" edited by Roy Fuller, Gabriela Peridigón. p. 214 - Metabolism of sulfur-containing compounds. 6. Inhibitory mechanism of melanin synthesis by glutathione. Matsuki M, Watanabe T. Yakugaku Zasshi. 2008 Aug;128(8):1203-7. 7. Glutathione as a depigmenting agent: an overview. Villarama CD, Maibach HI. Int J Cosmet Sci. 2005 Jun;27(3):147-53. 8. Skin-whitening and skin-condition-improving effects of topical oxidized glutathione: a double-blind and placebo-controlled clinical trial in healthy women. Watanabe F, Hashizume E. Clin Cosmet Investig Dermatol. 2014 Oct 17;7:267-74. 9. Reduced intravenous glutathione in the treatment of early Parkinson's disease. Sechi G, Deledda MG, Bua G et al. Prog Neuropsychopharmacol Biol Psychiatry. 1996 Oct;20(7):1159-70. 10. Randomized, double-blind, pilot evaluation of intravenous glutathione in Parkinson's disease. Hauser RA, Lyons KE. Mov Disord. 2009 May 15;24(7):979-83. 11. High-dose intravenous glutathione in man. Pharmacokinetics and effects on cyst(e)ine in plasma and urine. Aebi S et al. Eur J Clin Invest. 1991 Feb;21(1):103-10. 12. S-nitrosoglutathione. Broniowska KA et al. Biochim Biophys Acta. 2013 May;1830(5):3173-81. 13. The effects of S-nitrosoglutathione on platelet activation, hypertension, and uterine and fetal Doppler in severe preeclampsia. Lees C, Langford E et al. Obstet Gynecol. 1996 Jul;88(1):14-9. 15. “Glutathione. Your body’s most powerful protector” by Dr. Jimmy Gutman. 16. “Health and Nutrition Secrets” by Dr. Russell Blaylock. 17. "Glutathione. The Ultimate Antioxidant" by Dr. Alan Pressman.